Image description: a row of zafus and zabutons in a warmly lit zendo. A Dharma talk will be offered by a guest speaker, Rev. Fugan Dineen! Image description: A print of one of Hokusai's 36 Views of Mt. Fuji. A pastoral scene shows grasses and trees among rolling hills, just the peak of Mt. Fuji can be seen in the distance. Image description: A print of one of Hokusai's 36 Views of Mt. Fuji. A pastoral scene shows a few small figures with beasts of burden climbing a small mountain with Mt. Fuji in the background. Image Description: A print of one of Hokusai's 36 Views of Mt. Fuji depicting people walking a path in a marsh land with Mt. Fuji in the background. They are dressed in typical Japanese garb which is blowing in the wind, along with one person's papers. Image Description: A print of one of Hokusai's 36 Views of Mt. Fuji, depicting a temple roof top in the foreground with a kite flying and Mt. Fuji in the background. This Saturday we will be partaking in the practice of council in lieu of a Dharma talk. 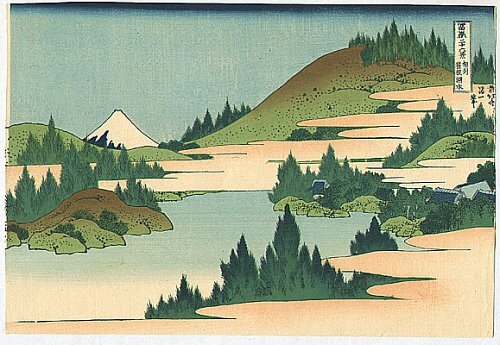 Image description: One of Hokusai'd 36 Views of Mt. Fuji showing a red Mt. Fuji. Image description: a snowy thawing field shows a labyrinth under the snow, in the distance a mountain and barren trees. Image description: a composite image made of three images, from left to right; the first a robed figure walks between 4 long rows of seated meditators. The second a single figure walks down a long corridor lined with plants. The third image is of the ground of the Garrison Institute, a tree laden property with the Hudson River in the background and mountains beyond the river. Join Ōshin Jennings and other NBZ Sangha members on our Year End Sesshin with the Village Zendo. More information, reposted here from Village Zendo's website. Part of our Winter Ango 2017-2018. The Village Zendo’s year-end retreat is the perfect time for quiet meditation and deep silence. Our schedule is serious (with plenty of zazen) but also spacious (with unstructured time in the afternoon for rest, outdoor walks or body practice). There are dharma talks every day, and ample opportunity to meet with our teachers. Delicious vegetarian meals are offered buffet-style. If you have put off doing a residential retreat, or felt intimidated to try one, this is a wonderful retreat to attend. Come and join the Village Zendo sangha as we greet the new year with clear minds and open hearts. NOTE: Registration will close December 22nd for our winter retreat at the Garrison Institute. 1. If you are a VZ member, email Lori at bookkeeper@villagezendo.org, and ask for the discount code for the full retreat or the half retreat. Members receive a $50 discount. 2. Go to the Garrison Institute’s website to register and make your payment. There is a line on the registration form for you to enter your VZ discount code. membership@villagezendo.org to discuss the registration process. If you are not a VZ member please go directly to the Garrison Institute’s website to register. Image description: a wooden backdrop withal silver metallic stars and frosted evergreen branches and snowflakes. And overlaid text reads, "End Of The Year Celebration". Come join No Barriers Zen for our last sit of the year in the SAC Chapel! We will be holding a council -- which is an opportunity for each of us to reflect on how our practice has gone for the past year, and to set our intentions for the winter break. After the council, there will be tea, food, drinks, socializing, and sewing patches onto our cushions! Please bring a vegitarian food or drink item to share! NOTE: Beginners are welcome! However, there will be no beginner meditation instruction at this gathering. Image description: a small stone statue of Jizo Bodhisattva rests his head on his hands, he has a small smile and peaceful expression. The statue is in a field of green moss and brilliant red maple leaves. Image description: A black and white image of plant vein structures, the overlaid text reads "No Barriers Zen Saturday Morning Meditation". Join us for Zen Meditation with a diverse community in ASL. This Saturday will be a Council, the practice of sitting in a circle and speaking from the heart. Ōshin will select a topic and lead us in this powerful practice. Everyone will have an opportunity to speak if they wish. A plank of wood floating in a lake by some grasses. A image of a an Andy Goldsworthy sculpture, sticks are arranged in concentric circles around river rocks. A photo of an Andy Goldsworthy sculpture, sticks are arranged in a lake so that their reflection forms a circle. A single yellow leaf, covered in dew, lying on a rock. A sketch of bison grazing in a field, text overlay reads "Zen Meditation JSAC 10AM"
Four deer standing in a field of tall grass, one deer in the center of the image stares directly into the camera. Contact the Village Zendo directly for registration and more info. "Summer ango, meaning “peaceful dwelling”, at Grail House in Cornwall, NY is a unique opportunity to step off the habitual tracks of our busy lives, to slow down and breathe. It’s a chance to do an intensive retreat, live in community, and study closely with Roshi Enkyo O’Hara and the Village Zendo teachers, in the green surroundings of the Hudson Valley. ￼Shuso Sesshin is an intensive five-day retreat with the same daily structure as Dai Sesshin. This sesshin culminates the month of ango practice and allows participants the opportunity for profound depth and insight. On the final day (8/20), the Shuso Hossen ceremony is a rite of passage in which the practice leader (shuso) becomes a senior student in the Village Zendo community. The shuso gives her or his first Dharma talk and is challenged by the group in a lively question-and-answer dialogue called 'Dharma Combat.'" An interior shot of Soji Zen Center, a panorama showing many meditators wearing black robes and the altar. Oshin will be guest speaking at Soji Zen Center in Lansdowne, PA.
For more information you can contact Soji Zen Center. Or read their flyer here. Image Description: A sculptural room by Andy Goldsworthy, an interior shot of a room made of sticks with a doorway streaming in light. A "Council", or wisdom circle practice, will be offered instead of the usual Dharma talk this week.